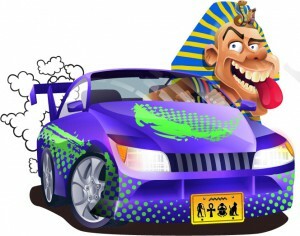 Tootin Car Man is an online video slot machine that combines an Egyptian theme, Las Vegas with a car theme. The mix of the two might not be one of the most fortunate around, but it will most definitely prove to be interesting. The Tootin Car Man slot has a classic set up and this way you can find 5 reels, 3 rows and 20 pay-lines. The graphics are nice and you can find many bright colors, neon lights and a background that will remind you of Las Vegas Strip, but with Egyptian symbols everywhere. The crazy mix of themes at this game is most likely going to make you feel confused at first, but once you get to know the bonus features better, you will start enjoying this game a lot and you will stop worrying about the crazy things you’re seeing. Some of the special symbols that are available while playing NextGen Casino’s Tootin Car Man are the wild and two bonus symbols. 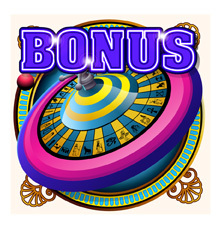 The wild symbol is the game’s logo, while the other two bonus symbols are the roulette wheel and the two fluffy dice. As soon as you start the reels spinning, you can trigger the “Tootin’ Wild Feature”. This is a bonus feature that is going to be triggered randomly and what is going to happen is that the Tootin’s car will show up and it will start spreading wild symbols all over the reels and this way your payout will get recalculated and you can end up with a much higher payout. In addition to the wild feature, the Tootin Car Man slot machine also features two special bonus rounds that are also packed with lots of prizes. In case you get at least three roulette wheel symbols, you can activate the Tootin Roulette Bonus. You won’t have to do anything special when this happens and as soon as this bonus round gets triggered, you can see Tootin’ arrive and drive two times around the roulette wheel and it will stop on a random multiplier. This multiplier will mean your payout and it will multiply your total stake. The second bonus round is called the Tootin Dice Bonus and it gets triggered by at least 3 bonus symbols that have the two dice and the word bonus written on it. This is yet another simple and captivating bonus round where you are taken inside Tootin’s car and there you have to guess whether the next dice roll is going to be a high or a low one. Every time you guess that correctly, you are given the opportunity to increase the multiplier that is awarded at the end of the bonus round. Even if you don’t guess this correctly you won’t lose the multiplier from the previous guess and in the end you can end up with a nice sum of money. Any winning spin can be double or quadruple thanks to the gamble feature. You just have to use the gamble button at the end of each winning spin and a simple card game where you have to choose the suit or color of a card, will appear. You can have up to 5 consecutive guesses.